U.S. Rep. Rod Blum (R-IA 1) announced Thursday that he will be taking part next week in a rally with Wisconsin Gov. 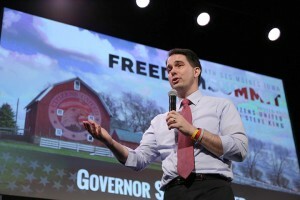 Scott Walker, widely believed to be announcing soon that he will run for the GOP presidential nomination. The event is planned for 12:30-1:30 p.m. next Friday, April 24, at the Cedar Rapids Marriott Hotel, 1200 Collins Road NE. Those interested in attending can RSVP at http://walkerblum.eventbrite.com. Blum has previously rallied with U.S. Sen. Ted Cruz (R-TX), who has already announced his presidential campaign.